The Fifty Factor: Sundays In My City #44 - & Giveaway! I'm a happy member of the Sundays In My City Community (SIMC) hosted by the fabulous Unknown Mami. Wanna see the world and join the fun? ...In my city-- Los Angeles, and always like walking through our front door. I'm content in our home and it's a nice feeling. But this Sunday, I'm dreaming of all the places I could travel to. Not crazy far away places, but perhaps cross-country, way North, the deep South, or anywhere in between. And with a wink and a much appreciated nod, I blame my new found desire for the wild blue yonder all on Ms Bake-It. It's been a very long time since I bought luggage, and frankly, didn't think I needed any until I spotted this baby. It got me thinking and, as they say, a mind is a terrible thing to waste. 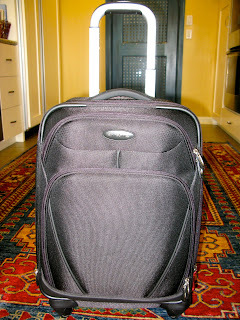 I never carry on luggage when I fly, it's too heavy for my arthritic hands to schlepp. But this suitcase has those wheels that turn in every direction and it's so lightweight that I realized, if I traveled with my Beloved Husband, things could work out really well for moi. You see, as I've spent the day plotting a new travel adventure, I realized that we'll check our usual luggage when we fly, but I'll carry-on this gem of a suitcase totally empty going on our trip, and he'll carry-on the suitcase coming back home-- filled with trip treasures, i.e., shopping purchases. It makes perfect sense to me-- In a totally *ahem* high maintenance kind of way. So thanks Ms Bake-It aka Tracy. You Rock! And I love your blog. You're funny and creative and down to earth and on my favorite blogs list. You can meet Tracy HERE. And YOU, dear reader, can win an $80 CSN Gift Certificate right here on my blog by leaving a comment BELOW and on all of my posts starting HERE (with giveaway details) through midnight, August 4th Pacific Time. The more posts you comment on, the more chances you have to win-- And go shopping! Where in North America do you think we should travel to? See more Sundays In My City Participants HERE. PS I was not compensated by CSN or Samsonite for this post. I'm just really happy I won. Try further afield, JJ. Try Scotland! What a fabulous suitcase!! And starting out with it empty is genius! Your mind is working well!! I purchased an automatic trashcan from CSN and we love it. So count me in on your drawing. CSN rules! Congrats on the win! The luggage looks like a great purchase. I think you should visit Michigan! Hi Joanna, You did great with the suitcase! Congrats on your winning the CSN giveaway, I ventured over to Tracy's blog and read about her finding antique store treasures. Cool. i would love to go to new york again...congrats on the win and i hope you put it to good use! happy sunday jj! Why in North America? How about Hawaii or Alaska? I have been thinking I want one of those suitcases with the four wheels next time I go somewhere. They are a lot easier to lug than the two wheel kind. Oh, and I meant to say, I had to change my blog URL. This avatar links to the new site. What a great bag! I am a bit of a home body too and I've never left the USA. Maybe one day. Enjoy your Sunday! Yay! Prizes! The money for that Samsonite couldn't have gone to a more deserving or appreciative winner! Congrats on your win! I love the front of your house. It's so inviting. Hope the back is exactly how you want it. Very nice bag! Now, you're ready for whatever adventure you plan. Bon Voyage! I am all about New York city. I could really use new luggage too. Great suitcase and congrats on your win!! I'm a lot like you in that the older I get the more content I am to just be at home. I love my home, it's comfy and cozy and my special place to just be me. Love the first pic, very inviting! Congrats on winning the giveaway! I think you should visit New Orleans, but do wait till this awful heat subsides. October through May is perfect and you would have so much fun! Newfoundland is on my North American list - I've always wanted to see St John, and a while back I read a book about the people who were stranded in Gander on 9/11 when airspace was closed down...we've been to Nova Scotia and PEI, too - Quebec City is beautiful, too! That's a beauty! I'd have snapped it up, too. You and I think alike when it comes to travel. I pack some of our things in a small suitcase and then put it in a larger, empty suitcase. That way I have an extra suitcase to bring home all the goodies we buy on vacation. As much as I love my home, I am always ready to travel anywhere and there are a lot more places I want to go. Of course, I'm lucky to live in Colorado, a place people travel many miles to visit. Nice case, I am in the market for a new one .. on my last trip a wheel escaped and I didnt notice til I was loading into the truck of the car! I love your red door as well....My front door is RED. I am fortunate to have all 6 of my grandkids only a mile from our home. I love to travel, but it's hard to leave them behind. I loved Hawaii...so my vote woud be there! Blessings on this beautiful day! I once participated in a local 'chat to win' contest. It lasted for about 2 or 3 days and I chatted until my fingers were bleeding. Out of the five-thousand total entries, I had well over half of them. There were pages and pages where I was the ONLY one who was 'chatting'. And do you want to know who won? NOT ME! Some girl who only had entered something like 7 times! SEVEN TIMES! So, my new motto is to only enter once and if I win, I win! If not......well, life goes on. Nice suitcase; now I'm waiting to hear where you take it! You got a bargin! That suitcase is huge!! I Want to be were you are in LA....Downey/Anaheim to be exact!!! How about Chicago? I love it there! I say a quick trip to SF would be perfect for that bag. BTW, I wore my new clogs on a long walk yesterday and I LOVE them! Your home is lovely, and LA is on my must see places. And your suitcase looks like it's dressed to travel!! As to where you should travel - how about to see the huge sequoia trees in that national park in California? Can't remember the name... And drive through those gigantic redwood trees? Would make great blog material! I love to travel. I never, ever carry on more than a book or now my iPad. Congrats. That's a really cool suitcase. The idea of bringing it back filled with trip treasures is awesome. Congrats on winning! And that suitcase looks FAB! I had so much fun on our trip to SF a few weekends back, I don't know where I would travel to next if I had the opportunity! Oh boy, I love suitcases. I just recently bought two new pieces and it really does whet that traveling desire :) Congrats on the big win!! Visiting from SIMC. I think you should go to Maine in the last week of September or first week of October. Absolutely beautiful. Btw, my hometown is in Ohio, too. Dayton. I love to travel. I love to stay at home too. Either way, I win. how come I never thought to take an empty suitcase? Yellowstone or visit the Red Rock areas in Utah or Sedona! Or New Mexico would be cool! I've been wanting to go to Maine. And now seems like the right weather to go! congrats on the win. and such a great color. hmm...south carolina, i think. i might love the charm. Come to Minneapolis! An easy light rail trip from the airport to a vibrant downtown with an active music scene and excellent food, the same light rail out to the Mall of America! Green parks! Art galleries and museums! Meeting Pearl for a margarita! Your place looks really nice. Congrats on your winning a US $100 certificate giveaway from CSN Stores. I'm a loyal fan of Samsonite. Thank you for all your kind words! I am so glad you are pleased with your win. Nice piece of luggage! I like your way of thinking! I have taken an empty extra piece of luggage few times knowing I will be buying stuff while I am traveling. Take a trip to Maine or come on down here to Florida! I would go to Puget Sound in August. Yes..that is where I would go. Did I spell it correctly? The older I get, the worse my spelling is and guess what...I don't care! Thanks for stopping by, and congratulations on your way cool prize! It's so fun to dream about the places you could go to! I'm like you - a total homebody. I'm just very content to be in my home. I've heard Maine is wonderful. Pender Island in Canada? I love in the desert, so I always think to escape to cooler climates! i like your way of thinking ! Love your home and the colors... just awesome! Someday, I want to see Vermont and Maine and everything else up there.